Heidi is eating well and appears healthy other than her problem front flipper. There have been no changes this week to how much movement she has and she still cannot use that flipper. We are thrilled to share with you that after almost two years of operations, we now have x-ray and ultrasound facilities at the Rescue Centre! 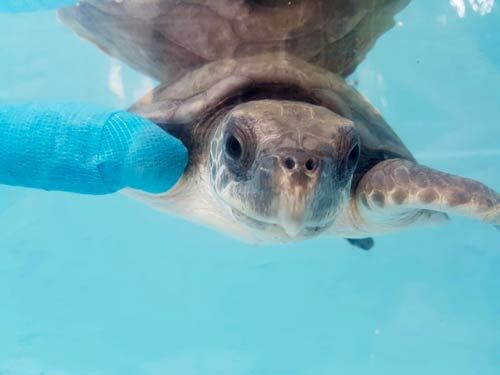 We no longer need to transport our turtle patients by speedboat to the nearest human hospital for x-rays (stressing out both them and us) and we can perform better diagnostic investigations. This is a huge help to us and enables us to provide better and more accurate treatments for our patients, thus improving their chance of recovery. The x-ray and ultrasound facilities were made possible thanks to the generous donations and efforts by many people. We would like thank all our wonderful supporters and sponsors who made this happen, including Peter Kettlewell from the Chipping Norton Veterinary Hospital, SEA LIFE Trust, Captain Ed Brooksbank and Sky Cargo, Veterinary X-rays, Coco Palm Dhuni Kolhu and Shawn and Laura Holm. 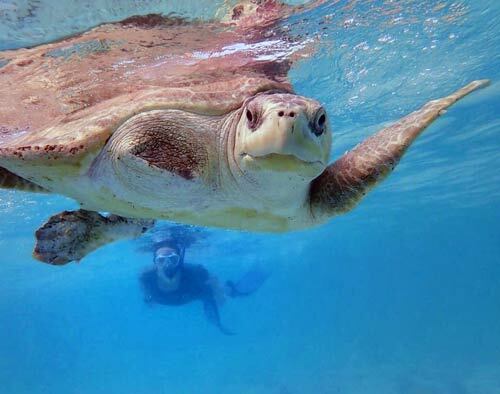 Without all of you we could not do our work helping sea turtles! It has been a very busy few weeks at the Rescue Centre! 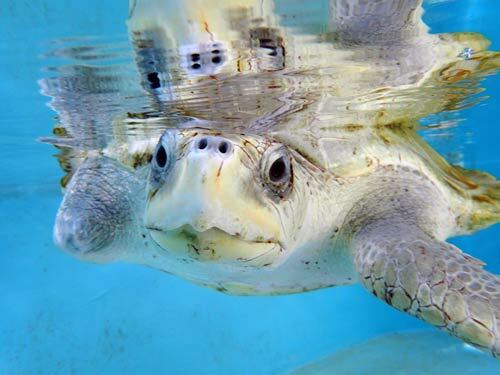 We have admitted 6 new turtle patient and successfully released 2 more recovered patients back into the ocean. 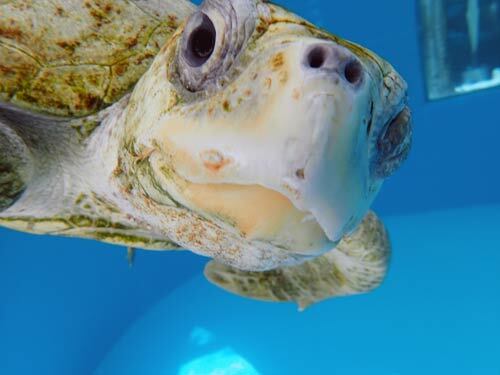 Sadly we also lost our baby green turtle Teddy. He was very sick and hadn’t been eating the whole time he was with us. Cocoa, the latest patient to arrive at the Rescue Centre, is a resident of Como Coco Resort. She came to us via Marine Savers on New Years Eve. 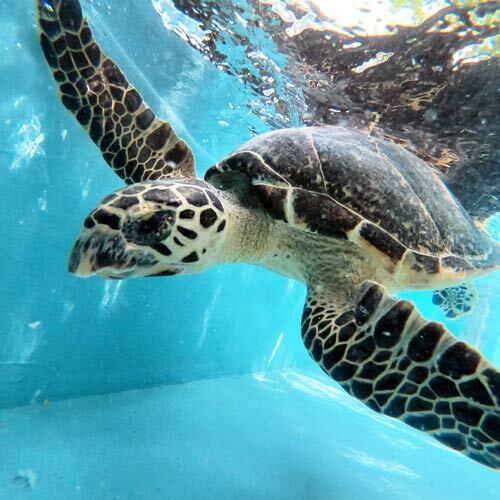 She is a juvenile hawksbill sea turtle. She appears very sick and is very buoyant. When she arrived we performed X-ray and ultrasound examinations and discovered she has left-sided pneumonia and severely thickened and distended guts. We cannot see plastic or a foreign body stuck at the moment, but it is a possibility. We will continue to scan her to monitor her guts for any changes. We are also doing a “barium study” of her gut. This is where we feed her something that shows up on X-ray so we can watch it pass through and find any blockage that may be making her guts so large. 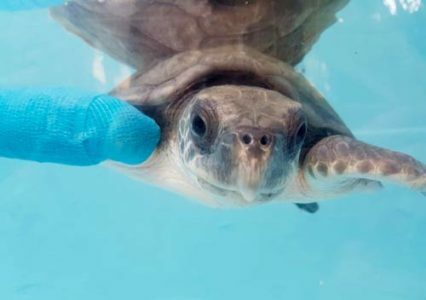 Debilitated sea turtles can take up to 50 days to pass food from their mouth to cloaca, so we will have to X-ray her over many days. After a couple of weeks at the Rescue Centre, Cocoa appeared to be doing better and started eating. She is very underweight so we started feeding her up over a few days, but then she stopped eating again. We performed a repeat ultrasound and found that some parts of her guts looked better; less thickened and moving a bit better. However, there is one section now that looks like it could be blocked. She is on drugs for her gut and pneumonia and we have surgically placed a feeding tube to ensure she gets food every day. Eve arrived on the 26th December 2018. She is a juvenile olive ridley turtle, weighing just 3kg. She was found at Como Resort entangled in a ghost net. Eve has lost her back flipper already and a front flipper is severely damaged from the ghost net, with two broken bones and deep cuts the whole way round. We are trying to save this flipper. She has had surgery and currently has a splint whilst it initially heals. So far Eve is looking good after her surgery and is doing well. She is diving and has lost her buoyancy. She is also very active and is eating well. Her wound from surgery is so far looking good. However, it can still break down after the 2 week mark, so we are keeping a close eye on it. We change her bandage every 2 days and keep her on antibiotics to prevent infection. As soon as the wound area is more stable we would like to remove her bandage, but at the moment the broken bone means there is too much movement. 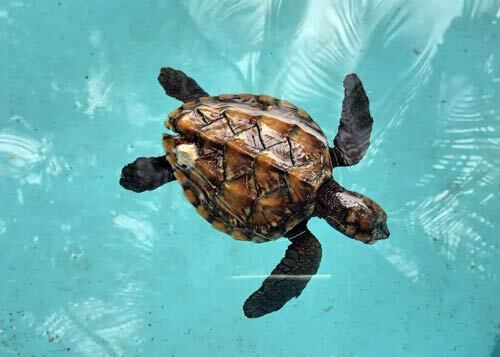 Lisle is a baby Hawksbill sea turtle who was found floating upside down on the reef at W Resort. She is only 2-3 months old. She arrived at the Rescue Centre on the 22nd December 2018. We X-rayed her and found she has pneumonia, for which she is on antibiotics. At first we were tube feeding her as she was not eating. Despite being very buoyant due to her condition, Lisle was still fairly active and pottered about her tank. Lisle is now making improvements and is eating well by herself, so we have stopped tube feeding her liquid food. She is lower in the water and her buoyancy is improving. She remains on antibiotics for her pneumonia and we will repeat her X-ray to check up on how she is doing. Daniella arrived at the Rescue Centre on December 16th, 2018. She is a juvenile olive ridley who was found entangled in a ghost net by Baros Maldives Resort staff. Daniella is very buoyant and has a front stump left from having self amputated in the struggle to get free from ghost net entanglement. She is doing well and has finally started eating after 3 weeks at the Rescue Centre. Turns out she has a huge appetite! Now that her strength has improved we plan to perform surgery in the next few days to remove the stump left by the ghost net. 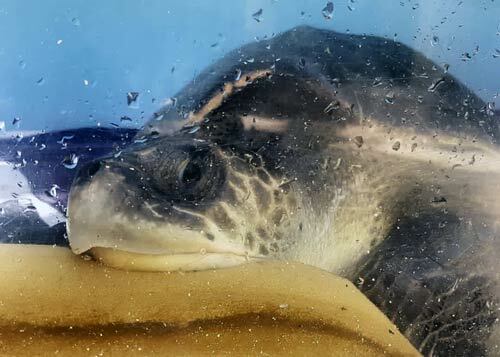 Lulu, a young olive ridley, was sent to us from Marine Savers on the 2nd December 2018. Lulu had large cracks in her shell and sea water had entered her lung and shell. She was dry docked on antibiotics for 2 weeks before we repaired the shell. With the arrival of our ultrasound machine we were then able to do more diagnostics. We discovered a huge amount of infection and fluid inside her lung and shell. We then performed surgery, draining 1.7 litre of pus from her lung. Her right lung was past the point of recovering and she had a huge amount of infection and dead tissue inside. We did our best to try and flush out the infection, however, it was too late by the time she came to us. We tried hard to save her, placing a feeding tube into her stomach and putting her on I.V. fluids. but sadly she passed away 25 days after arriving. 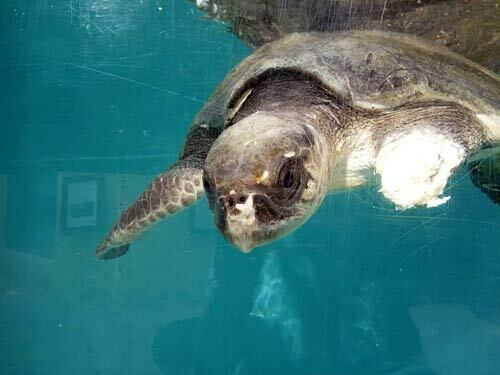 Phoenix, an adult olive ridley female turtle was found entangled in a ghost net with severe injuries. She was found by Kuredu Prodivers staff in Lhaviyani Atoll, who took her to Atoll Marine Centre, Naifaru, where she was brilliantly triaged. She received fluids, and was dry docked and tightly wrapped due to the severity of her injuries. The team named her Phoenix as they though she must be incredibly strong to have survived this horrific ordeal. On 26th November 2018, Phoenix was transferred to us. She was in a very bad way. Her back flipper was missing and one front flipper was literally rotting from infection, exposing all her bones. The other front flipper was damaged and swollen – she could not use it at all. 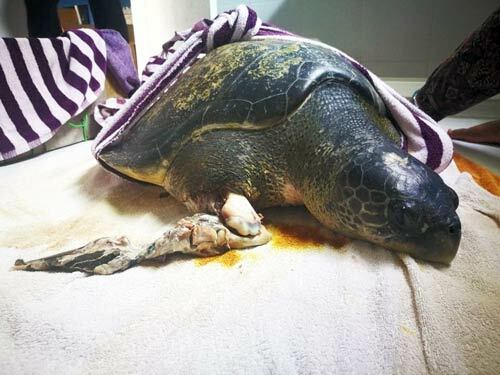 She even had areas of infection on her remaining back flipper. We amputated both her front flipper and her back flipper the day she arrived. She was put on strong antibiotics in the hope of recovery, although she would remain a double amputee. After a week she was not responding to antibiotics and her other front flipper, also deeply wounded, started to fall apart, exposing more of her bones. Phoenix, weak from the infection and not eating, sadly passed away 11 days later. During the postmortem to assess the overall cause of death, we discovered a large fishing hook embedded in her oesophagues. 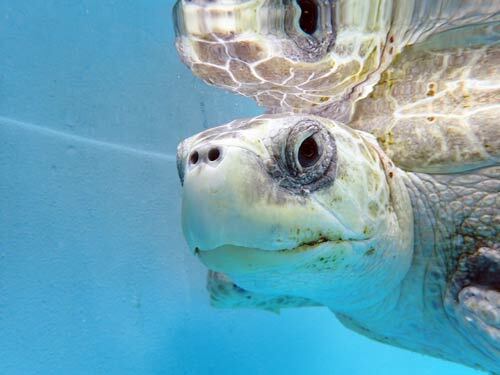 Phoenix was not only a victim of being entangled in ghost nets – she also ingested it. Phoenix’s injuries were the most horrific injuries caused by ghost net entanglement we have seen at the Rescue Centre. Nadia first arrived at the Rescue Centre on 17th February 2017. A ghost net victim, she arrived with an injured front right flipper and severe lacerations to her neck. We tried to save her flipper, but unfortunately we had to eventually remove it. After successfully recovering from surgery at the Rescue Centre, she was taken to Juvenile Naifaru for further rehabilitation on May 13, 2017. Nadia suffered from buoyancy syndrome and was unable to dive. In September 2018 she was finally spotted spending time at the bottom of the tank! She returned to us to spend some time in our large tank to further improve her buoyancy and hopefully get her ready for release. Upon her return, Nadia was initially very buoyant; it is likely that the long boat journey to the Rescue Centre stressed her out, worsening the buoyancy. She did not manage to dive down after food at all. She also had a very swollen eye, which had been a problem over the last year. We treated her with eye ointment, antibiotics, anti-inflammatory and vitamin supplementation. After a couple of months back the the Rescue Centre, Nadia was diving well in her tank and was frequently spotted resting at the bottom. We started taking her for swimming lessons in the ocean to try to improve her buoyancy and give her some exercise. However, each time she would become tired and start floating to the surface. Finally, on December 24th, she showed no signs of buoyancy problems. We swam with her for a while to ensure she was not popping up to the surface. And then she suddenly disappeared off the edge of the reef! We are so happy she is back home after almost two years in rehabilitation. It was the best Christmas gift we could have asked for! 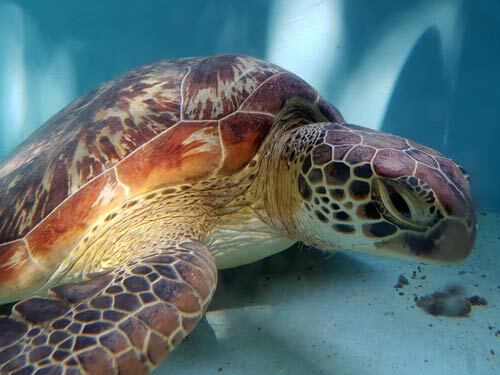 Kamana, a young female green turtle, was found with a fishing hook deep in her neck near Four Seasons Landaa Giravaaru Resort in Baa Atoll. Kamana was likely a victim of illegal hunting. The fishing hook entered from the outside and went deep into her neck. We performed emergency surgery the night she arrived to remove the hook. It was a difficult surgery as the hook was very deep, passing through two sides of her oesophagus. It was also lodged deep, close to important nerves and blood vessels. She recovered well in the Rescue Centre tanks, but she did not eat anything at first. We collected sea grass for her, offered her salad items from the kitchen, and even looked out for a jellyfish to see if this would tempt her! In addition, we covered over part of her tank to try and reduce stress levels in the hope she will would be tempted to eat. To mimic her natural grazing experience, we weighed the sea grass down with dive weights so that it would sink and she could eat from the bottom of the tank. Finally we saw some progress! Once her wound had healed and her stitches had come out, we released her back into the big blue. Penny is diving well in the tank after her meals, however, she still pops back up to the surface when she stops swimming. We will continue to take her for swimming lessons in the ocean. Heidi is much the same, however, with the arrival of our new X-ray machine we are now able to gain more information from our turtles. We initially thought her problem was in her elbow, but it turns out it is in her shoulder joint. She also has calcium deposits in the muscle. Both these things give her a bad prognosis for regaining use of her front flipper and we will likely have to re-home her. Heidi is eating well and appears healthy other than her problem front flipper. Isla is doing well and continues to eat, but she has not started diving yet. She had an X-ray and ultrasound and appears to have and area of diseased lung on her left side. It’s a possible cause of why she continues to struggle with her buoyancy. Juanita is much the same. 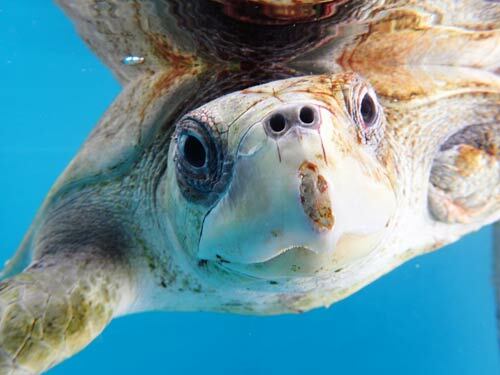 She recently had an X-ray which showed that her shell is filled with air from a likely lung tear. It also appears she has a lung bulla, which is a pocket of air in the lung, that also contributes to her buoyancy. This gives her a bad prognosis for recovering from buoyancy syndrome. She will have repeat X-rays, using more angles, to confirm this.